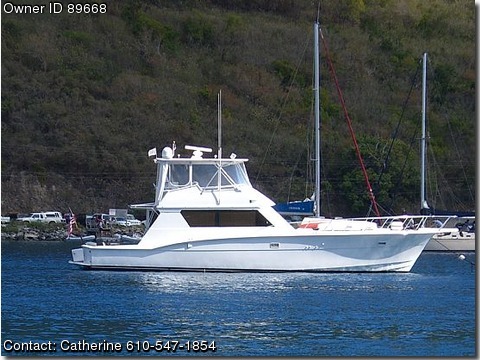 Call owner Catherine @ 610-547-1854.Boat is in St.Croix Vrgin Islands. This vessel had a complete overhaul in 2004; rebuilt to fully simulate the 2002 Hatteras Convertible model. Twin Detroit Diesels, 12V71TI’s (Turbo-charged) with 840 HP. Since overhaul, the port engine has 220 hours and starboard has 600 hours. New (2009) port-side Northern Lights Generator (200 hours). She has a three stateroom layout (sleeps 6), three heads and three showers. The interior was completely upgraded and a low-profile galley was installed. New cabinetry, headliners, frameless windows, and new interior wood work were added throughout. All furnishings and entertainment electronics were replaced along with new interior wiring and new sound system. She shows like a much newer boat than a 1982 model. A 2011 engine service has just been completed.